The Golden Beach home of a prominent South Florida philanthropist who died last year is listed for $42.5 million. The beachfront estate at 387 Ocean Boulevard hit the market in May with Coldwell Banker’s The Jills team. The 10-bedroom, 10-bathroom home was built in 1941 and sits on a 62,750-square-foot lot. Records show the estate of Barbara Schlesinger owns the property. Barbara, a philanthropist and socialite in South Florida, owned the property with her late husband, Sheldon Schlesinger, a noted Fort Lauderdale attorney. Property records show the Schlesingers paid $865,000 for the home in 1985. 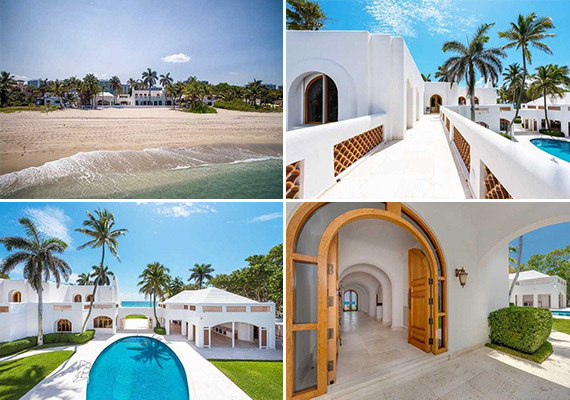 The all-white, Mediterranean-style estate includes a gym, movie theater, cabana, oval-shaped pool, as well as a separate two-story guest house with its own kitchen, pool and beach. According to Realtor.com, it has not been listed since its last sale. Listing agent Jill Hertzberg declined to comment on the property. Golden Beach, a small 247-acre town, is east of Aventura and north of Sunny Isles Beach. The luxury enclave is home to celebrities that have included Bill Gates, who’s assembling his own compound in Wellington; Ricky Martin and radio host Tom Joyner.